We left High Camp at 5.15am at dawn. The trek which was very narrow had only been opened a week since a big dump of snow closed it to trekkers. Trudging through knee-deep snow, we stopped every so often to get a good lungful of much needed oxygen and admire the surrounding views. Mountains up to 8000m towering above made us feel very small indeed. But unfortunately along the way the persistent problem of the Terrible-Awfuls had returned and had me running off into the snow until I found a small bush, careful not to trip and slide all the way down the mountain! The sky brightened up and allowed me to take some great photos. Even with my happy-snapper, I managed to get some great shots, but of course it’s never as good as the real thing. The views up here are breathtaking and we were very lucky to have blue skies for the few hours of our climb. There is a teahouse halfway to the top and the vendor served big cups of tea, but for some reason I couldn’t get mine down and tipped it out. As we proceeded to the top, he followed us and passed, as he wanted to open the top tea house. We reached the top in less than three hours and had another cup of hot sweet black tea and took the obligatory photos of the prayer flags. 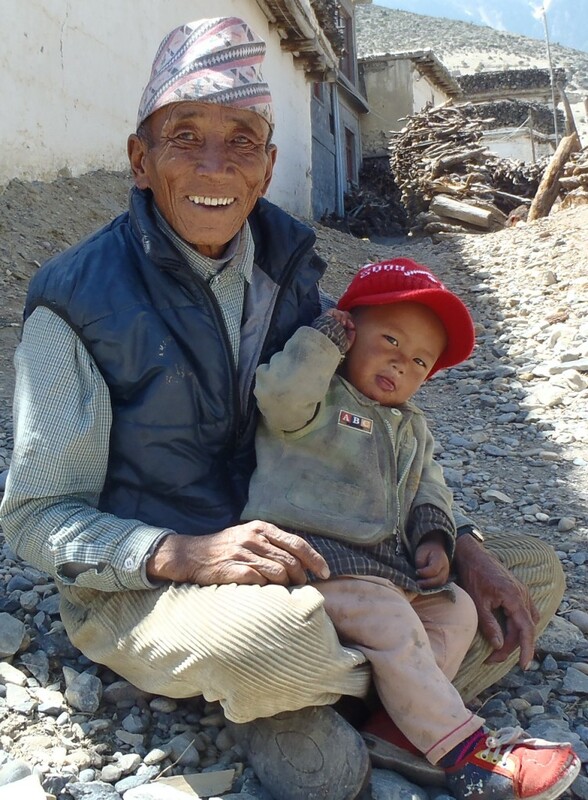 At the pass we thanked Bhes and said farewell to our little mate from Manang. We sent him away with a pocket full of Rupee, a promise to post him a photo of all three of us at the top, and a frozen Snickers bar. 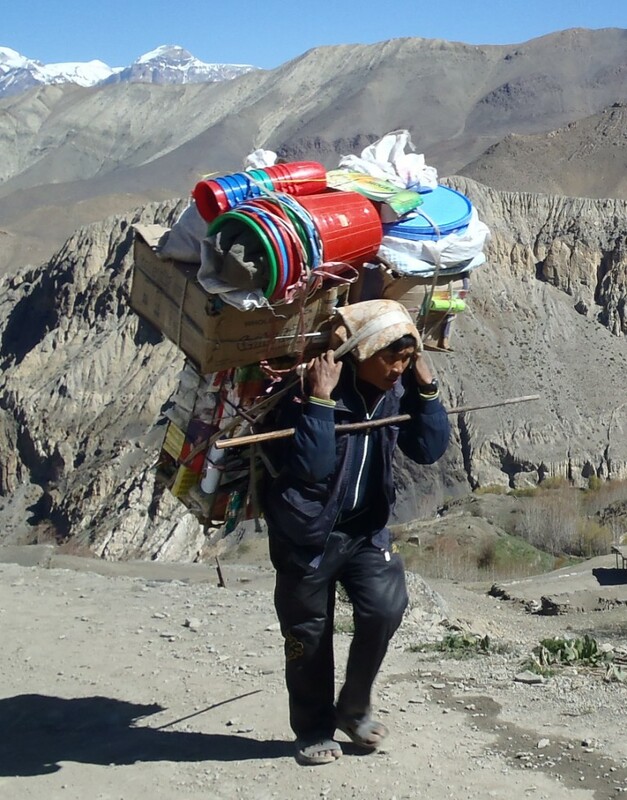 Once we’d repacked our backpacks from three bags to two, we began the 1600m downhill slog to Muktinath. The extra weight wasn’t so noticeable although my knees began to ache halfway down. The first couple of hours from the top of the pass was quite slippery with ice and slush. Wayne managed to slip over at least three times; on one occasion I thought he had decided to take up break-dancing! He looked like a turtle on its back as he slid down the hill on his backpack. He landed with a thud on his elbow and I was worried he’d broken his arm, but he was okay. 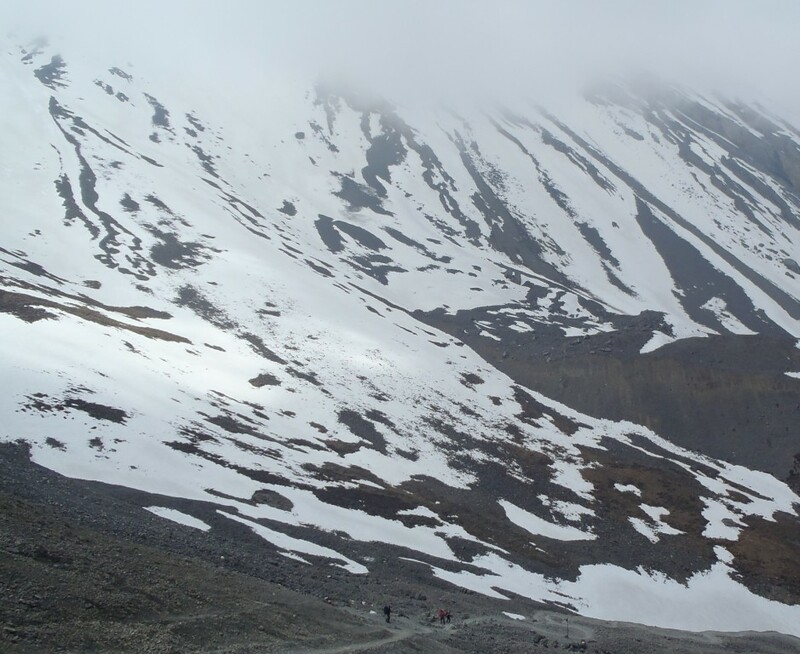 We walked out from the snowy icy paths into the scree and dust at around 4800m. There were a few trekkers crossing the pass on the same day so we weren’t alone and had plenty of people to have a chat to along the way. Apparently in the high season (Oct/Nov) there’s hundreds that cross the pass each day. We reached the five tea houses at Charabu by 1pm and had a cold soft-drink and a Thukpa (noodle soup) for lunch. Another hour we finally reached Muktinath downhill walking from 5416m to 3800m in just over five hours – nine hours in total for the day. In hindsight, we could have taken our packs without a porter. However, for the small fee it was probably more enjoyable to have Bhes carry a good percentage of our load for us. In fact I think the day to the Ice Lake was a harder climb. 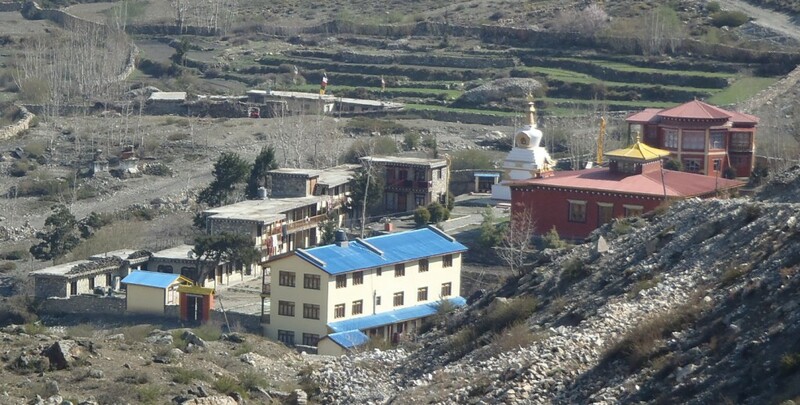 Muktinath is a sacred place for both Hindus and Buddhists alike and has been for over 3000 years. According to the two religions, it is the only place where you will naturally find the five elements from which everything is made – earth, wind, fire, sun, water. Many Hindu and Buddhist pilgrims pass through the town each from neighbouring India and other parts of the world. In Muktinath, we stayed at the Hotel Buddha – the best guest house so far. Hot shower, own bathroom, warm blankets and a western style flushable dunny! Yay! We bathed then drifted into a deep sleep until 7pm when I woke just before a rap on the door, the owner asking if we were having dinner. As is customary, we went to the dining area and had a feed of chicken spring roll and chips for me, and Wayne had chicken curry. A rest day usually means washing clothes, popping blisters, walking around, reading or just sitting watching the locals do their thing. Many trekkers don’t have time for regular rest days and we often see them pushing through day after day without a break. They’re usually at a guest house in mid afternoon and gone by 8am the next day. When the tourists have gone the locals come out for their daily activities – sorting out their wares, sending the kids off to school, washing their clothes and hair and prepare for the next wave of trekkers. We’re lucky we have the time to relax and soak in the atmosphere of each town at a relaxing pace. 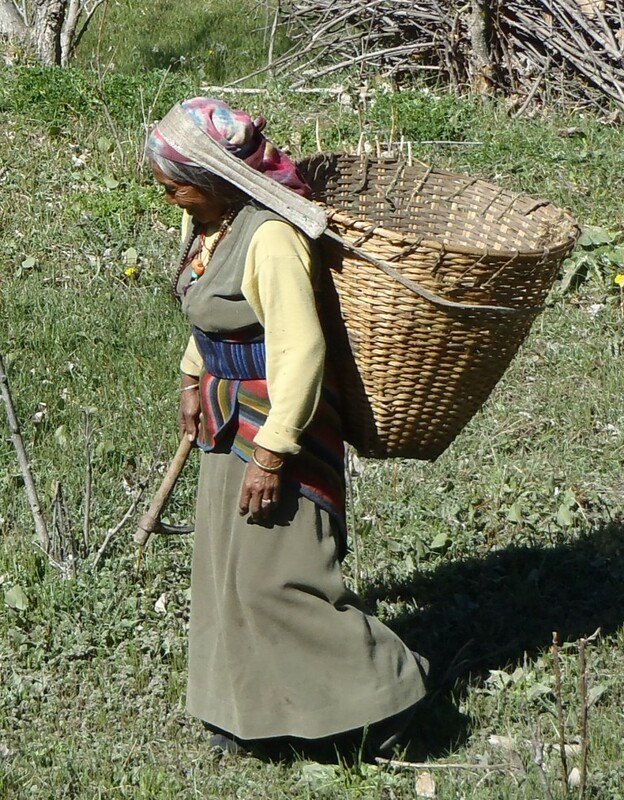 Souvenirs are available along the trek but the locals don’t push too hard in selling them. Of course if you show any interest in any item you are fair game. Muktinath has the usual Tibetan bronze or brass Buddhist or Hindu artefacts, Yak wool scarves, hats and gloves, plus also has ammonite fossils available for the pilgrims that visit each day. The black ammonite is considered the veneration of the God Vishnu. You’ll often see women in this region sitting on rock piles smashing rocks to find ammonite. Muktinath is at 3800m and for some reason both of us could not sleep, perhaps due to the couple of glasses of celebratory beer we’d had the night before. So we were already tired as we prepared to continue our trek and descend 1000m from Muktinath to Kagbeni, a three hour walk. Walking with weary knees, we passed the village of Jharkot then through the pretty village of Khinga. The final hour into Kagbeni was very steep switchbacks into the deep Kali Gandaki valley. 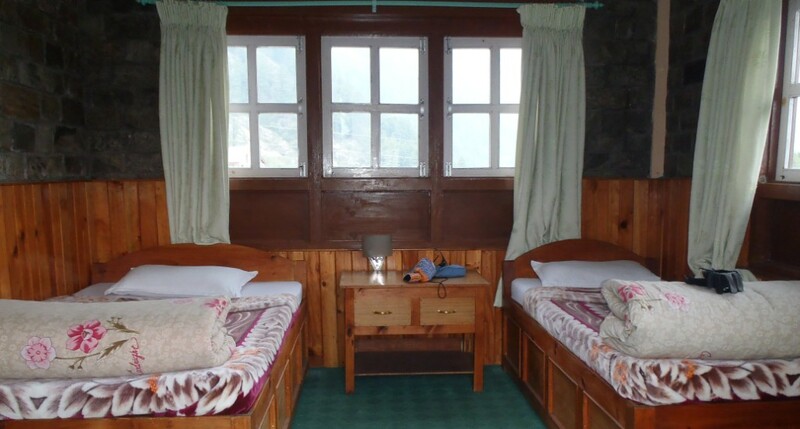 We chose the Annapurna Lodge for accommodation and had a reasonable room and meal that night. Red and white painted rocks clearly identify the NATT trails along the circuit. 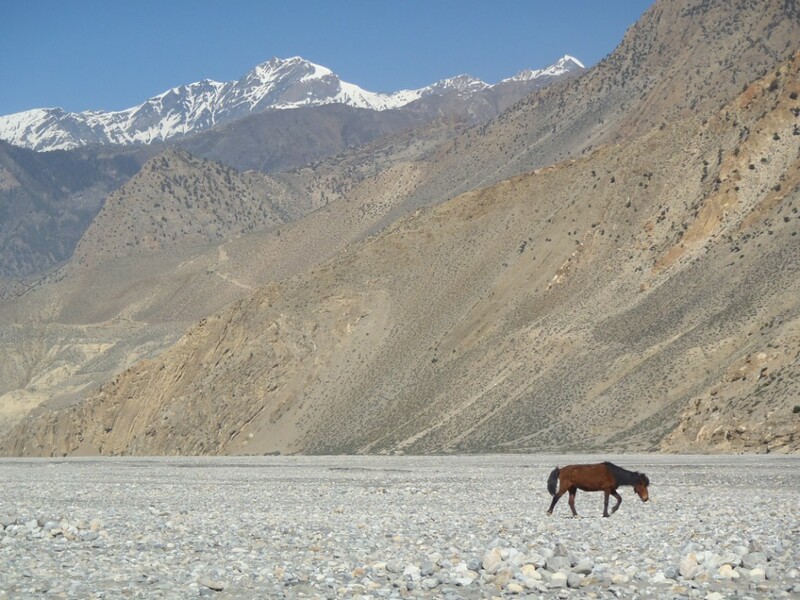 The dry, desolate upper Kali Gandaki valley is quite distinct from the narrower Marsyangdi Valley leading up to the Thorong La Pass. The Kali Gandaki is considered the deepest valley in the world and has amazing geological formations. The strong wind increases from around 10am and picks up dust and rocks. The views of the valley are stunning as the 7000m high Nilgiri Himal towers above. 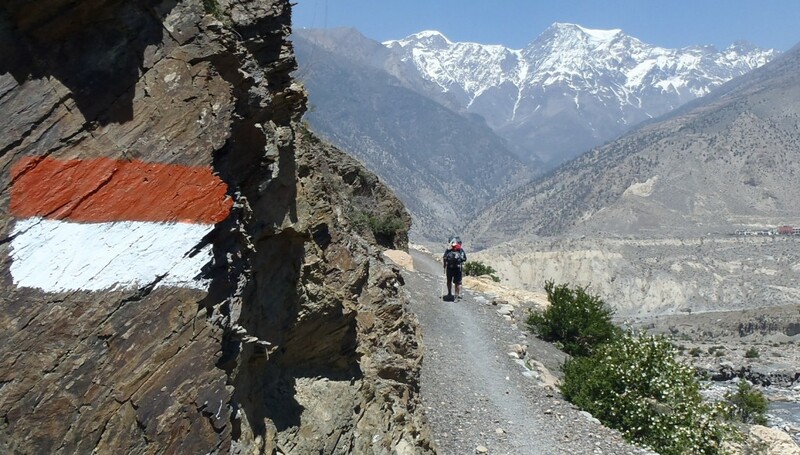 We thought Marpha was an hour away from Jomsom, but as we’d taken the NATT trail and not the road, this diversion was to take a further 3.5 hours but we passed through very steep and scenic paths via the villages of Thini, Dhumba and the Tibetan refugee village of Chhairo. Marpha was on the other side of the river and back some distance so as we were both tired we decided to stay at a guest house in Chhairo. It’s a shame as Marpha is supposed to be very pretty and one of the ‘must-see’ places on the trek. We were the only guests in the village of Chhairo it seemed, as one-by-one the locals would come by to look at us. We spoke to the local teacher who spoke reasonable English. He said the local kids are taught up to grade 4 then if they’re lucky they go off to boarding school. The village was very tidy and the kids played in the dusty streets until sunset when they were called in for their dinners. After school the children of the village returned home to do chores or play in the streets. 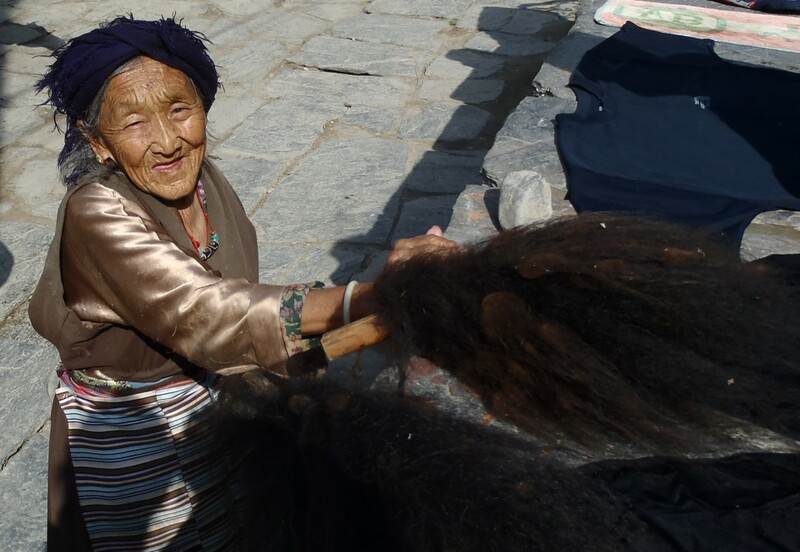 The owner of the guest house washed her daughter’s hair in the sunshine, while an old Tibetan women from across the road tried to sell me some bracelets and I managed to get her down in price for a couple of them. Not something I like to do but I really didn’t need them! Before long she was back with some handmade dusters made from Yak hair. I tried to explain that Australian Quarantine would have a fit if I brought ‘yak dusters’ into the country so she shuffled back to her home across the road with the dusters under her arm. A young guy cooked for us and his mum, the owner, spoke reasonably good English. No hot water in our room but the beds were comfortable enough. The beef curry I had was a little salty with big Tibetan doughy momos to mop it up. He wasn’t sure how to cook a fried egg so Wayne explained to him how to cook an egg for breakfast to which he listened most attentively. The next morning he was so apologetic when the fried egg appeared dripping with oil with a burst yolk. He gets points for trying though and we scoffed down our meal regardless. From the modest accommodation we said goodbye to our hosts and with fresh socks and full bellies, walked from Chhairo over the thick bed of nettles on the forest floor. The forest opened to a pasture and orchards at the base of the high slopes of the valley. Walking only an hour or so to a metal suspension bridge we crossed the Kali Gandaki valley to the road on the opposite side to reach Tuluche in a further 30 minutes. A short rest with a cup of tea and Sprite at a guest house, we continued walking a further two hours along the dusty road until we reached Larjong stopping for lunch at the Riverside Lodge and German Bakery. Of course the menu was just the same as everywhere else with not a German bun in sight. One of the best places we stayed on the trek. Much more comfortable than a tent! 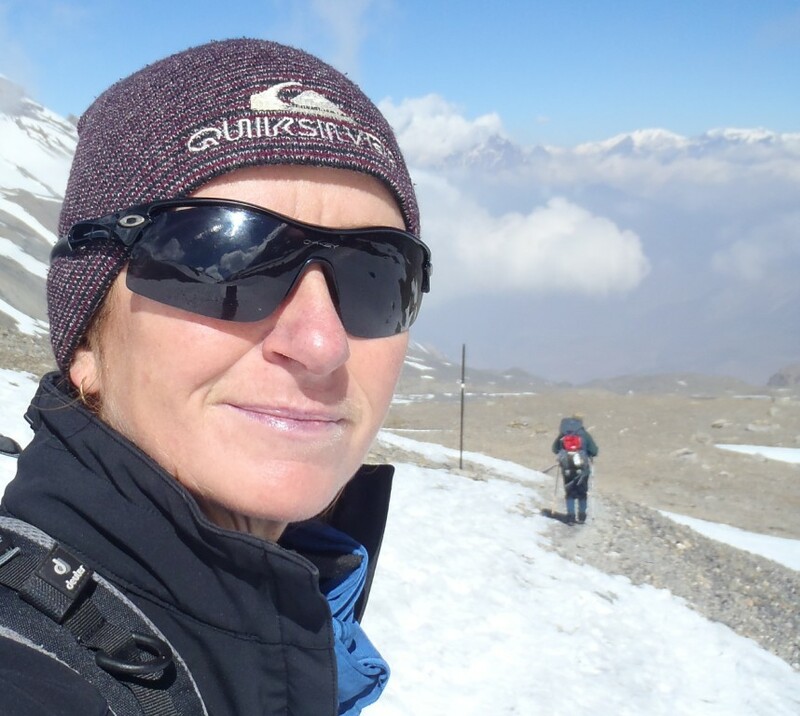 Dhaulagiri, at 8167m, is the seventh highest of 14 peaks over 8000m mountains in the world; Annapurna I is the 10th highest mountain. Although the massif is over 100kms away, views of both are excellent from Kalopani, particularly in the morning when the sky is clear. Unfortunately though, much of the best views usually have power lines in the foreground making it a little difficult to always get the best shots. Being a rest day I was up early hand-washing clothes under the outside tap before having breakfast and reading a book in the sunshine while the washing flapped in the warm breeze. 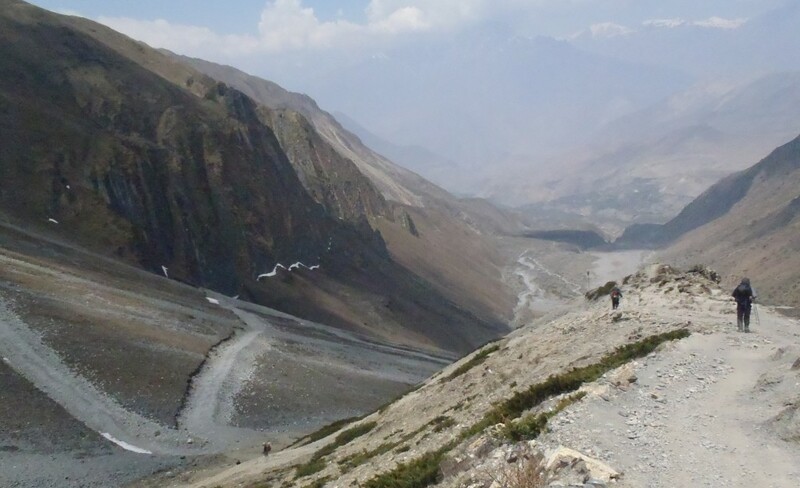 As has been the case around the road/trek, the number of trekkers passing through Kalopani has decreased since the road was extended all the way to Jomsom. Many trekkers have had enough by Jomsom and choose to either fly back to Kathmandu or take a jeep for the remainder of the trip to Pokhara. However, pilgrims on their way to Muktinath often pass through by jeep stopping at the guest houses for lunch. Today was Mother’s Day in Nepal, known as ‘Mata Tirtha Aushi’ and the lunchtime rush was busier than usual as mothers of all religions were treated to a special lunch. I would call my mum on Mother’s Day the following Sunday. I must say that the Dhal Bhat at the See You Lodge was the best tasting I’ve had so far and the staff are very friendly and keep the place very tidy and clean. Taking advantage of the clear sky, I was once again up early to take clearer shots of Annapurna I and Dhaulagiri before the clouds rolled in and blanketed them for the day. A big day was planned as we hoped to reach our final destination of Tatopani by nightfall so once more we were up early for a bowl of porridge, we then left Kalopani by 7.30am. The walk took us through forests and off the road for most of the way, passing through villages of Ghasa, Kopchepani, Rupsechhahara and Dana where we joined the road again. Nepal’s Village Development Committee (VDC) promotes ‘Open Defecation Free’ towns with a campaign to improve toilet conditions by installing toilets within homes and improve overall hygiene. Sanitation is another basic we take for granted in our home country. This increasingly popular and successful campaign is widely supported with many villages proudly displaying their town as ‘Open Defecation Free’. At one point on the road the land had slipped, as it common in this region and an excavator was busy clearing the way for the vehicles by scraping away the rocks and rubble. He casually suggested we walk behind him to get past. The unstable ground under our feet caused me some angst as we delicately stepped over the rubble hanging onto the excavator before running to safety on the other side. We continued on as the rain began for the final leg of our trek. We arrived at the Old Kamala Lodge Tatopani at 3pm for a nice cold beer and accommodation overlooking a large orange tree in the courtyard area. Although the full circuit continued on for another 35kms, we’d chosen Tatopani as our final destination and would catch a bus on to Beni then Pokhara. This trek had taken three weeks and we’d walked just shy of 200kms including all the side trips and the NATT trails. We’d also taken more rest days than other people, basically because we had the time to do so. We could have easily shaved off a few days, but what was the point. The next stage of our trip would take us to Chitwan National Park. 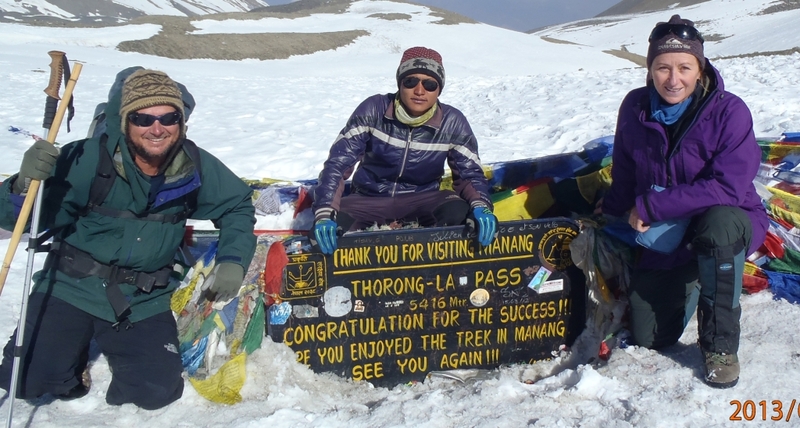 This entry was posted in 2013, Nepal and tagged ACAP, Annapurna, Chitwan, Muktinath, Nepal, trek. Bookmark the permalink.